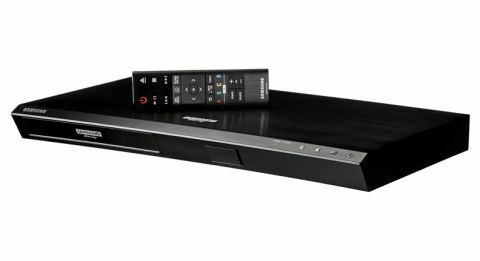 Samsung UBD-K8500 review | What Hi-Fi? You’re at the cinema. You sit down to watch the trailers, set down your super-sized beverage and begin digging through your bucket of popcorn. You’ve been waiting to see this film for ages, and now it’s time. But it’s not all that impressive, because you saw something just like it the other day. Only it was better and you can’t help comparing. Let’s stop stretching that metaphor and talk about the Samsung UBD-K8500, the company’s first Ultra HD Blu-ray player. We saw a prototype in Berlin last September, and it has finally arrived in our testing rooms. But Panasonic got here first, and the DMP-UB900 blew us away with its vivid idea of what Ultra HD Blu-rays are capable of. Unfortunately for Samsung, it set the bar very high indeed. No it’s not your imagination, the casework really is curved. Why? It’s something to do with all those curved TVs we’ve been getting over the last couple of years. Assuming you have one of those, Samsung would like your Blu-ray player to match. There are no performance benefits, it’s just an aesthetic thing. Our experience with oddly-shaped boxes is that they look silly more quickly than ‘classic’ boxes – there was a reason Sony abandoned its geology-chic Blu-ray players inspired by crystals. Oh and the curve means you might see the UBD-K8500’s undercarriage peeking out. The top of the player sports a sheet of metal, which looks and feels nice, but sadly, this doesn’t extend to the rest of the player, which is coated in black plastic and feels a little tacky. The Panasonic DMP-UB900 is also liberally coated in plastic, but at least that has a nice mirrored finish and makes a solid stab at justifying its price tag. There is no display, just a couple of LEDs blinking at you. With no screen telling you what the player is doing, you don’t know whether it’s loading, or how much time is left on the film. We might expect this from a £90 Blu-ray player, but not one costing £430. Instead, you get a tacky plastic flap hiding a USB port. Around the back, there are the essential plugs: power, ethernet, digital optical output and twin HDMI sockets. That’s less well equipped than the Panasonic DMP-UB900, which also offers an SD card slot and a digital coaxial output, plus a full array of multichannel analogue audio outputs. We round off our tour with a look at the remote control. It’s small and easy to hold, not far from the little ‘smart’ remotes that come with many of Samsung’s fancier TVs. But it’s fiddly, especially in the dark. There’s not much to differentiate the directional keys from the central ‘select’ button, and you’ll have a hard time hitting ‘pause’ in a hurry. Panasonic’s backlight feature would have come in very handy indeed. We also note this remote drops the typical AA and AAA batteries for those coin-sized 3V batteries. On the whole, though, it’s pretty good to use. This UHD Blu-ray player doesn’t lag horribly like the first Blu-ray players did. Loading, from the moment the disc tray clicks shut until the disc menu appears, takes 30-40 seconds, which is decent, given that regular Blu-rays take about 20. We did have a couple of glitches involving the picture disappearing, or the machine crashing altogether. This was sorted out by restarting the machine, so we’d put it down to hiccups, rather than a full-blown personality issue. The menu system is clear and easy to navigate. Unlike Panasonic’s minimalist approach, Samsung has gone for massive tiles, where the option for playing a UHD Blu-ray takes up a quarter of the screen. There are separate menus for settings and apps, which include include key video apps such as Netflix and Amazon, both of which allow for 4K streaming through the Samsung. MORE: 4K streaming vs 4K Blu-ray vs Blu-ray – which is best? Time to spin some discs, and we put on a UHD Blu-ray of The Martian, which comes with the player. The opening is a good combination of interior dialogue and exterior action, where Kate Mara and Jessica Chastain talk about weather reports before heading outside to a sand storm, mixed in a DTS HD Master Audio soundtrack. But in truth, it’s not a great audio performance from Samsung, which lags behind the Panasonic at every turn. The voices often have a hard edge to them, as do the sound effects, which sound a little dynamically flat. Meanwhile, the Panasonic’s sound is richer and full-bodied, with more subtlety and detail, which adds a substantial dimensionality to the sound. The Samsung’s sound is also not as spacious, nor as dynamic. The sand storm never really feels as deadly as it should, and when Matt Damon is struck by a satellite, the impact never feels that strong. When the Panasonic does it however, you fear for his safety. When it comes to video, the difference between the Samsung and Panasonic isn’t quite as much of a chasm. On the whole, the Samsung puts out a proficient 4K picture with impressive clarity. It does a good job with HDR (High Dynamic Range) material too, showing off extra detail in the shadows and providing a good range of colours. But the Panasonic still retains the edge. The Samsung puts out a good amount of vibrancy in its hues, but they are not as rich as on the Panasonic, which is also better at shading and providing a sense of depth. As for Blu-rays and DVDs, the Samsung handles them with confidence, but it’s the same deal with Panasonic offering a little more in subtlety of shading and edge definition. A final note on compatibility: you can play 3D Blu-ray, but not SACD and DVD-A. Overall, the Samsung UBD-K8500 is something of a disappointment. We have been very excited about 4K Blu-rays, but we don’t feel that this player gets the most out of our discs. We can’t imagine a scenario where we’d recommend it over the Panasonic DMP-UB900, despite the price advantage. UHD Blu-rays exist to give you the very best picture and sound you can get right now. If that’s what you’re after, we’d suggest looking elsewhere.